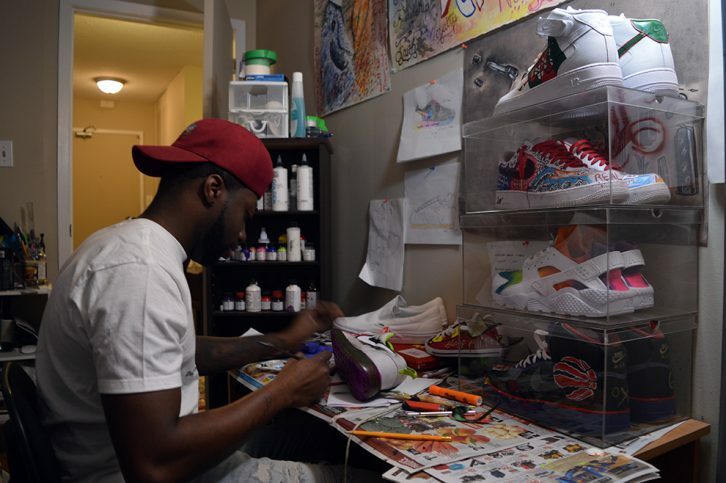 Kemmy Smith holds a white Nike sneaker in one hand and a paintbrush in the other. He’s leaning over his desk, which is covered in shoes and flyers, as he paints the shoe. The sneaker’s characteristic swoosh is outlined in black paint. As Smith talks, he paints it purple. Smith, 24, a part-time art student, part-time barber from the Bahamas, paints custom shoes out of his one-bedroom apartment in Halifax’s south end. 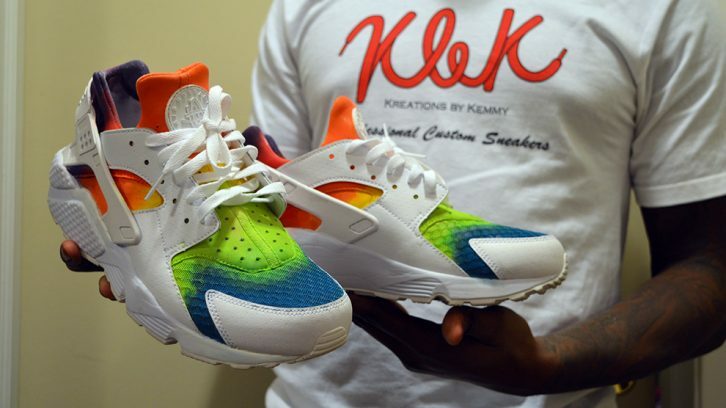 He’s customized about 35 pairs since July, and spends approximately 30 hours a week working on them. He buys all of the equipment and to date, he says he’s spent about $2,000 on supplies. There are shoes spread throughout Smith’s apartment — on tables, cupboards and stacked neatly in his closet. The apartment walls are adorned with his artwork and a white banner several feet long hangs above his bed. The banner features a bright red shoelace, which forms the initials of the name of his business in cursive font, followed by the words Kreations by Kemmy, Professional Custom Sneakers spelled out below it. Currently, Smith is working on a pair of Batman themed sneakers, but he’s done everything from Game of Thrones to Gucci-inspired shoes. Smith has always loved both sneakers and art. But, when his friend first asked him to paint a pair of shoes in July, Smith balked at the idea. “I was scared as hell,” says Smith, but he decided to give it a try. 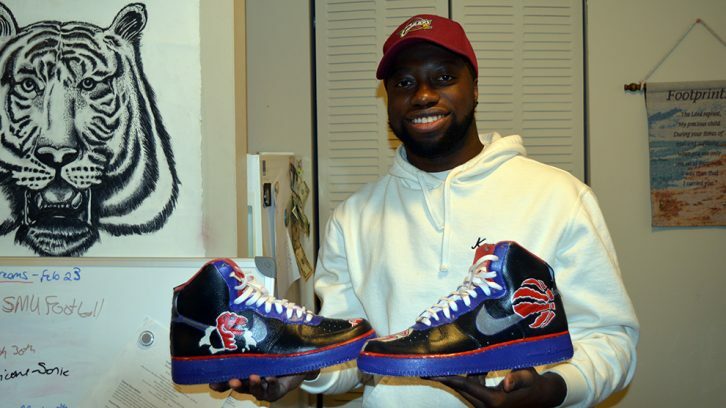 The shoes turned out well, and with only one year left in his degree in interdisciplinary arts at NSCAD University, he decided to turn the custom shoes into a business venture. From there, he began sharing his designs on social media and started a website to feature specific styles. Smith paints any and all shoes. Customers can either provide him with a pair to paint (he only accepts new shoes), or they can tell him which size, colour and type of shoe they want and he’ll get it for them before painting it. Despite accepting all kinds of shoes, Smith has a favourite canvas: Nike Air Force 1. “It’s got so much space and there’s just so much you can do with it,” he says. The process of creating a custom shoe works much like a tattoo. Smith sits down with the customer and together they come up with a design, then Smith sends updated images of the design to the customer until they approve it. Painting shoes requires technical knowledge. First, Smith says, the shoe has to be cleaned and “de-glazed.” Without de-glazing — removing the factory finish of the shoe — the paint won’t stick. Sometimes, Smith even has to sand a shoe in order to remove the glaze. Next, he tapes the shoe, allowing him to cover areas he doesn’t want to get paint on immediately. Then he mixes his colours. “Certain shoes have a different surface,” says Smith, “So you have to mix (the paint) with certain chemicals.” He uses acrylic paints specially designed for leather. Mixing colours is one of his favourite parts of the process. “I like creating different hues, and experimenting with colour,” he says. Smith says his love of shoes originated when he was in high school. Although, some of his collection dates back even further, including a pair from 2004 he’s never worn. Many of Smith’s customers are local athletes. They range from students who want their shoes to “look good” for the season, to professional athletes like Ta’Quan Zimmerman, a point guard for the Halifax Hurricanes. Zimmerman, 26, found out about the shoes directly from Smith. Smith is his barber and mentioned the custom shoes to Zimmerman while he was giving him a haircut. Zimmerman now owns three pairs of the custom shoes. He says he loves how creative the designs are. 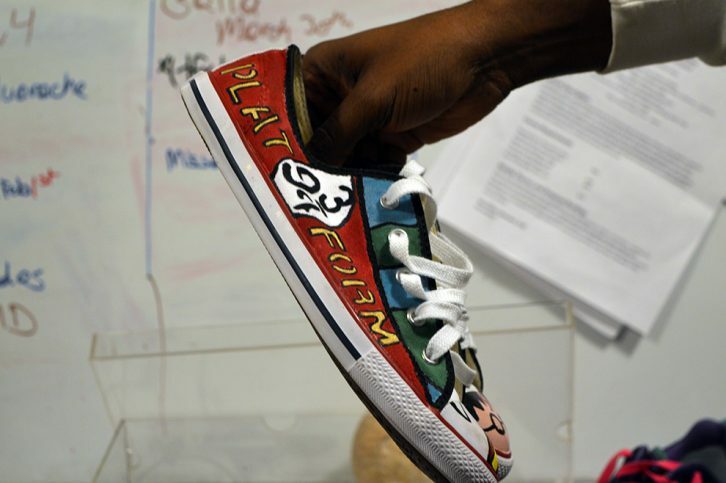 “The artwork that he can put on a shoe is pretty impressive,” he says. Together, he and Smith designed Zimmerman’s first pair: black Vans sneakers that read “Sup” on one foot and “true to yourself” on the other. Another pair is painted specifically for the court, with a Halifax Hurricane design. As a self-proclaimed sports lover, Smith says his dream is to design custom shoes and cleats for professional athletes. 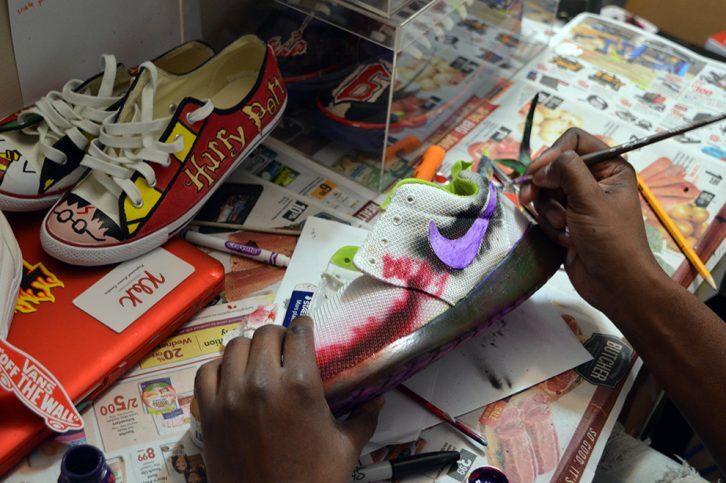 One day, he hopes to paint a different pair of cleats for an NFL player for each week of the season.